My 20 months old son loves animals, and he plays with the animal figures all day long. 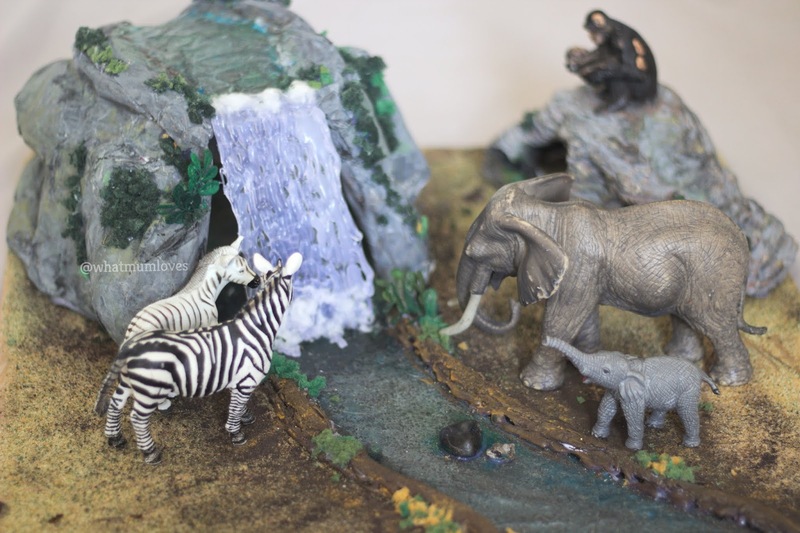 I wanted to create a simple, yet quite a realistic diorama for him, ideally including a river/ watering hole and a waterfall. 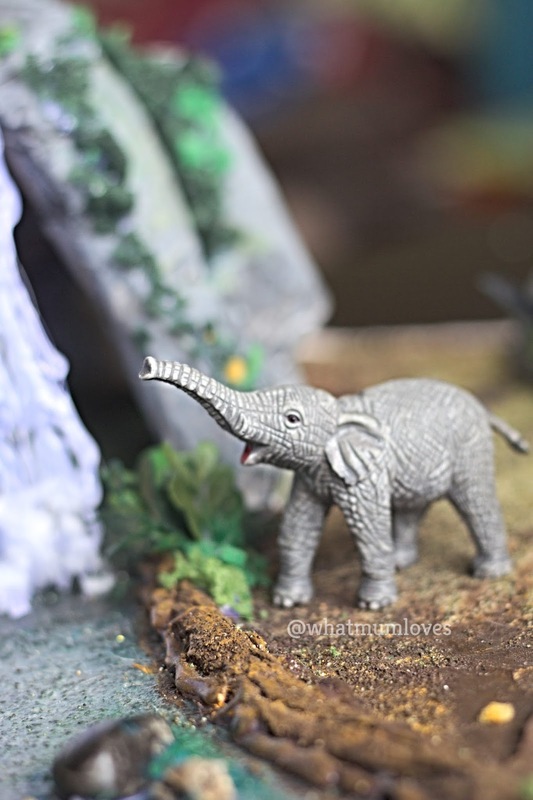 I love the one that Schleich offers, but I chose to make my own one. 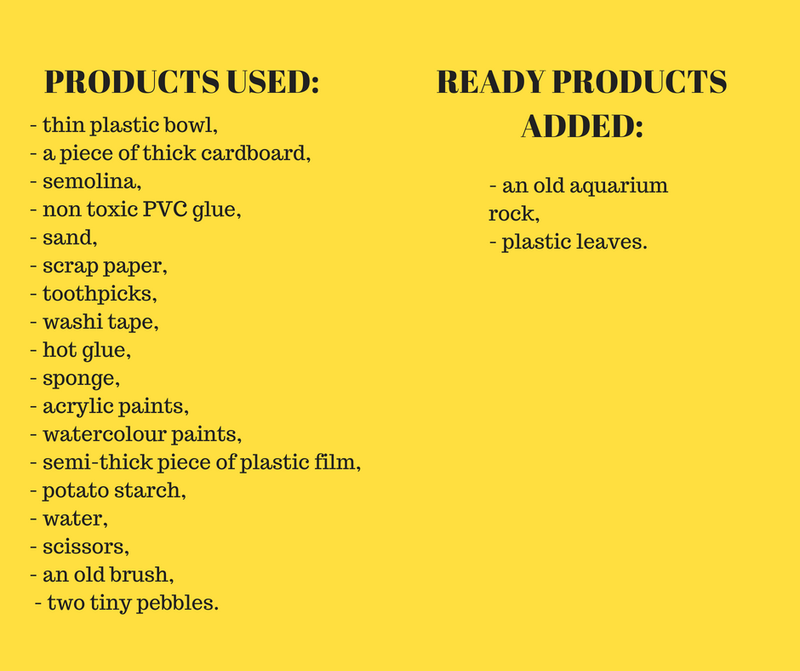 I wanted to challenge myself though and create a zero cost project, using exclusively the products that I already had at home. I decided that the plastic bowl will be a base for my waterfall rock. I cut an opening in it, using sharp scissors. 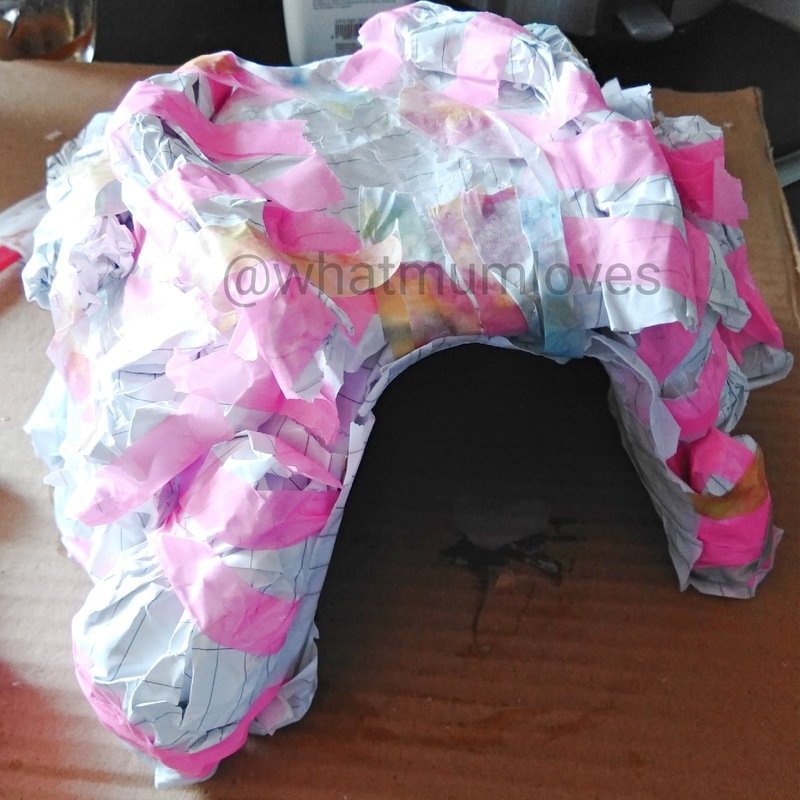 I prepared several pieces of scrap paper, which I wanted to stick to the plastic bowl to create layers and make it a little bit stronger, too. I lined the bowl with 2 sheets of paper (inside and outside). I secured them with the washi tape. To make my construction stronger, I used some toothpicks on the top of the inner layer of paper. I glued them with some hot glue, and once the glue was dry, I added some washi tape for additional support. I secured the sides of the hole, the back and the top of the bowl. I used around 40 toothpicks to do that. I made the construction stronger with paper, washi tape and toothpicks. Since the glue isn't toxic, I decided to apply it with my hands (to save time). I simply dipped my hands in it and spread it evenly on the top of my waterfall rock. Then I was just adding more paper and covering it with the glue until I was happy with the result (4 layers of paper in and out). I left it overnight to dry. My waterfall rock at the end of day 1. 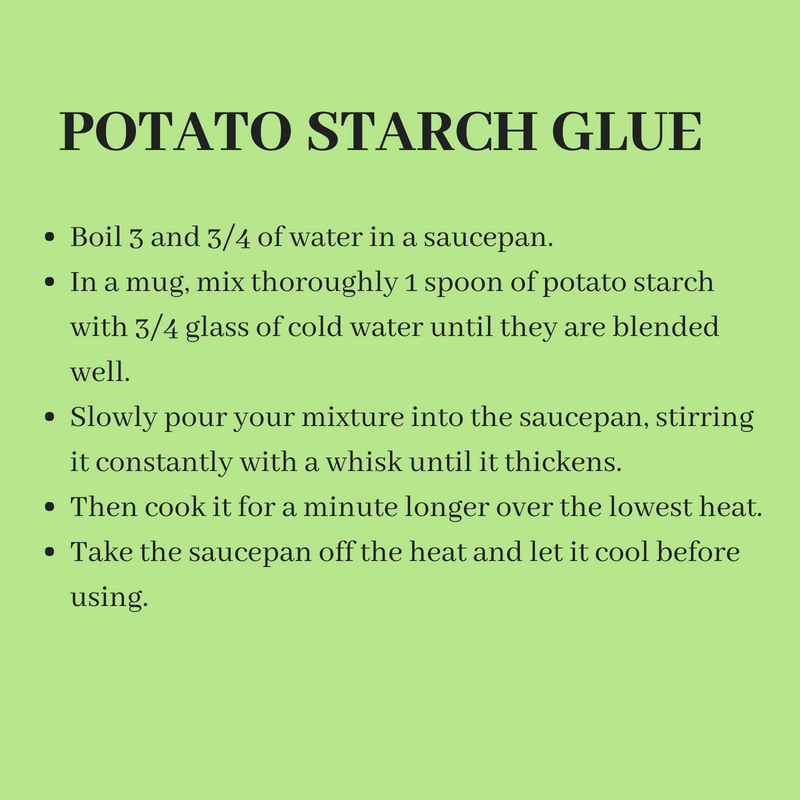 The potato starch glue is the best natural, non-toxic glue, perfect for simple DIY projects. Meanwhile, I prepared my plants and leaves. I cut some old foam into tiny pieces and mixed the shreds thoroughly with the acrylic paint. I decided to divide the foam shreds into 3 groups and dye them viridian green, yellow ochre and pickle green. Viridian green foam shreds getting dry. I had some old and worn out plastic leaves, so I have cleaned and sanitised them. Then I painted them dark and medium green. When the paint has dried, I sprayed them with a clear lacquer acrylic paint and left them to dry overnight. Making the base was quite easy. Firstly, I covered the cardboard with my potato starch glue and lined it with some brown paper bags. I tore them into smaller pieces for an easier application. I needed two layers of paper bags to cover the cardboard completely. The method is very simple- cardboard+glue+layer of paper bags+glue+layer of paper bags+glue. Again, the base needs to dry overnight. I saved these paper bags because I knew they had an amazing upcycling potential! They gave the diorama's base a cool look and texture. Once everything was dry, I needed to start painting my waterfall rock. I wanted to do a few layers of colours, to give it more uneven and realistic look. I first painted it military green, then added some warm, dark brown. Next light grey, then medium grey, and when I was happy with the result, I started shading. When shading, you want to use more than one colour. I started off applying a bit of medium grey where I wanted to create shadows and darker spots on my rock. Then I added a bit of olive/ military green and teeny tiny of black. Generally, the more you shade- the better and more realistic it looks. Browns, blacks, greens and greys will be the best. When the waterfall rock was dry, I painted the water on the top of it. I used brown, green and light blue. I left it to dry and I started to work on the cardboard base. 1. Green and dark grey. 2. Light grey. 3. Shading added. All done with watercolours (with a minimal addition of water). I wanted to have a river and I wanted it to be not flat. 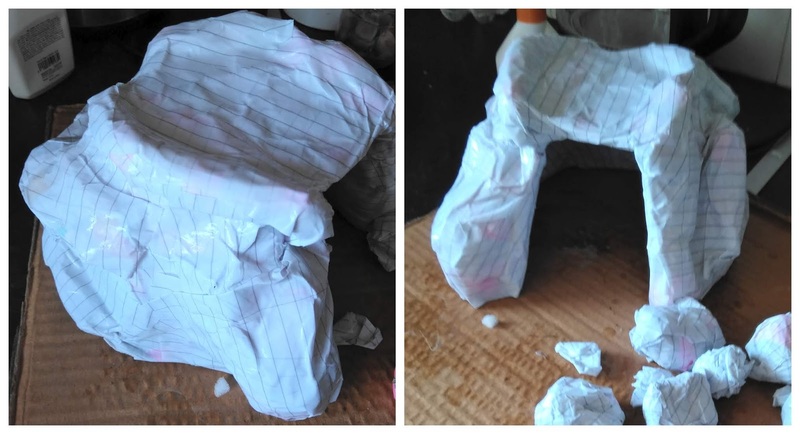 I initially thought of carving it in a piece of a thick foam or making a thick cardboard/ styrofoam base, but it just would be good for this project.So instead, I chose to make banks from two long rolls of paper (each from two A4 sheets). I simply creased the paper, rolled the first sheet, covered it with potato starch glue, added another sheet of paper, rolled again, and covered it with a glue. When my paper rolls were completely dry, I thoroughly mixed non-toxic PVC glue for kids with dark brown acrylic paint and sand. Then I covered my paper rolls with it, and allow them to dry. I went ahead and drew the river. I wanted to create an illusion of depth, so I added some leftover paint, glue and sand mixture to the bottom of my river. Then I painted the water over it. I chose to mix brown, green and light blue to match the water on the top of my waterfall rock. 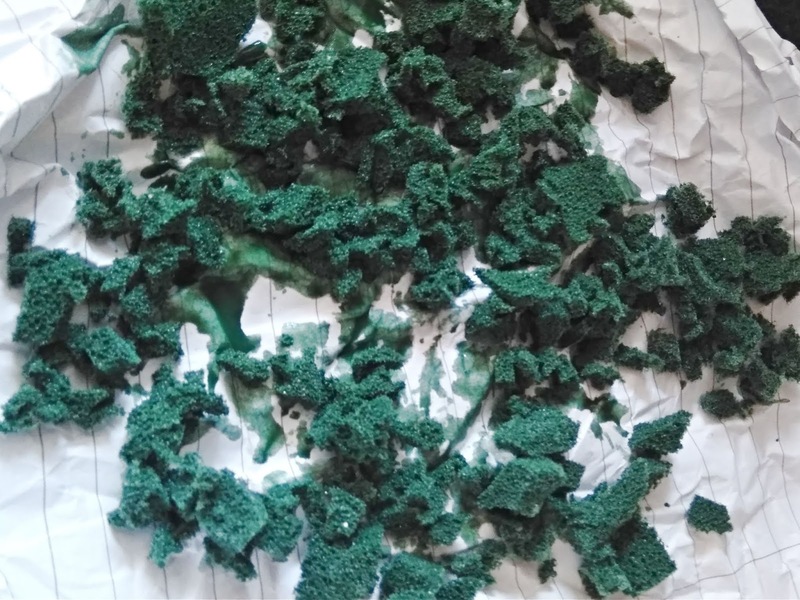 To create a grass I used some dyed semolina (I dyed half of it sap green, half yellow ochre). I was gradually applying PVC to the base of my diorama and covering it with semolina. I let it dry. Once it was dry, I glued the banks of the river to the base with hot glue. I needed to use quite a lot of it, to ensure that they will stay put. Then I painted the banks dark brown, and I blended the colour into the 'grass' to make it look like the mud. 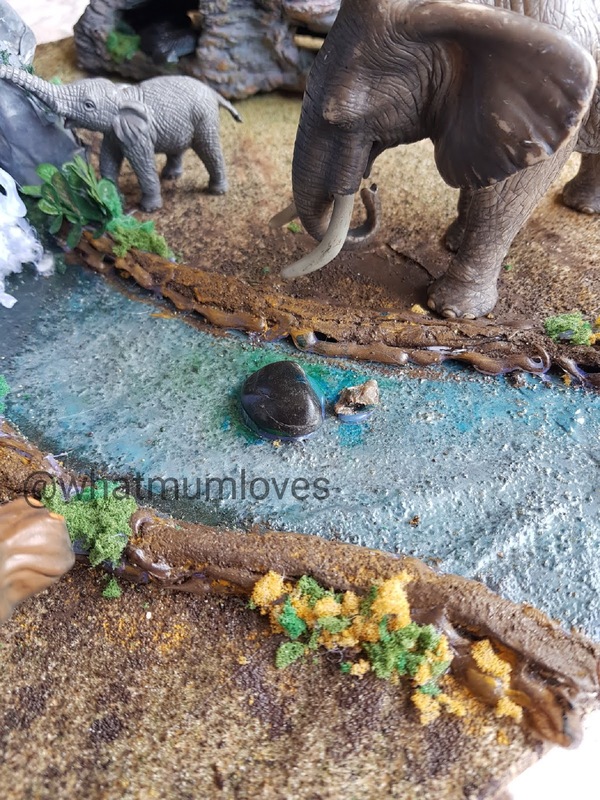 In the end, I added two real rocks to the river, using the hot glue. Once it was all dry, I sprayed it with the clear acrylic lacquer. 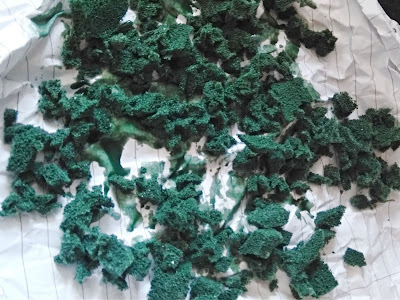 When my base was getting dry, I started applying the plants and leaves to my rocks (the ready one and my waterfall rock) with the hot glue. I was doing it slowly and gradually as the hot glue dries down in seconds. 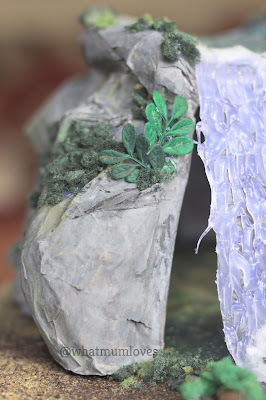 Once I was happy with the look of my mountain rocks, I have glued them to the base using hot glue. This was the trickiest part of creating my diorama, as I needed to be very quick with applying the glue. I glued a few plants to the river banks, to add some life and colour to them. I wanted to add some shine to my river and the water on the top of my waterfall. I went ahead and applied two thin layers of my non-toxic PVC glue (waited for each of them to dry properly before applying the next layer). 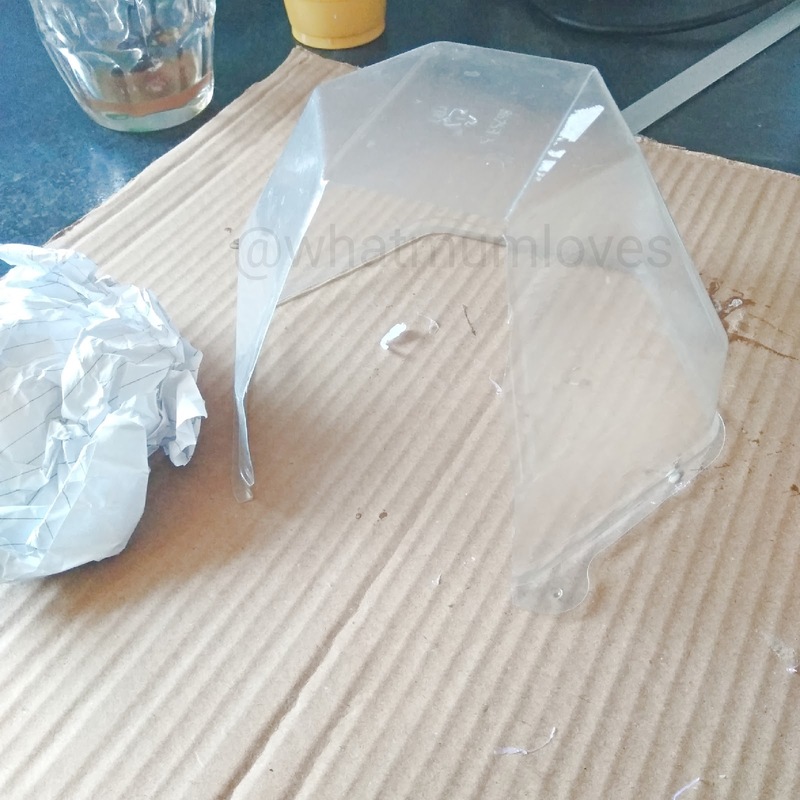 When the glue was dry, I sprayed a little bit of hairspray to the cup and applied it on the top of the layers of PVC glue for the extra shine. ]The final step was making the waterfall. All I did was cutting a piece of semi-thick foil, and covering it with the strips of hot glue the length of my waterfall. 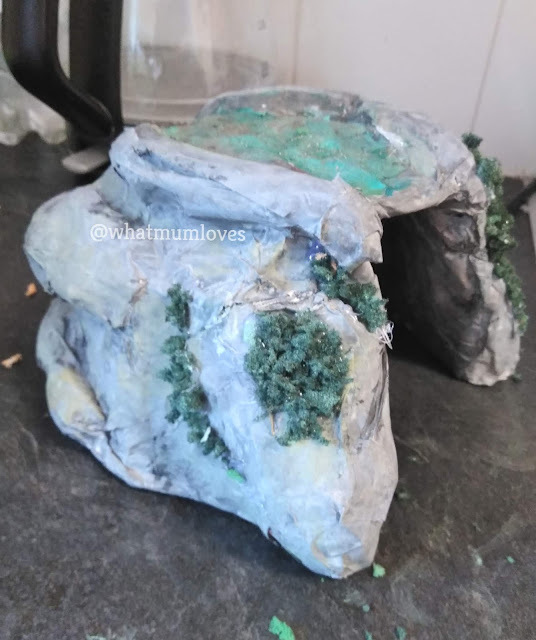 I added a bit of cotton wool to the top and the bottom of it and attached it to my rock using hot glue. Et Voilà! 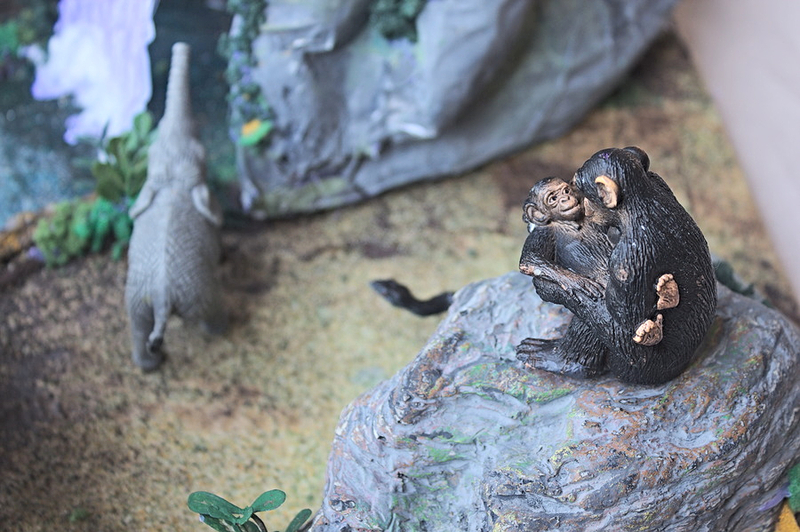 The diorama was ready. Let me know if you liked it, and if you would like to see more of my upcycling projects in the future. How very cool! It's great to be able to upscale items that might otherwise be thrown away. Amazing! What a great idea!! I love the DIY tips here. So creative. Thank you, Laura, for such a sweet comment! You made my day! How cool is that, it looks awesome. I'm currently upcycling recyclable materials for a costume my son needs for his end if year school party. If it works out OK he'll be Paw Patrols Chase for a day! haha awesome! I am sure he will love it! This is an amazing creation. I would never have guessed it was made from recycling from the photo!